on October 19, 20 & 21, 2009. Cover photo by Bernard Minier. 1 CD "Guerilla Series" Mini Single Jewel. 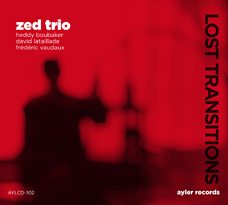 Toulouse-based sax player Heddy Boubaker, along with fellow guitarist David Lataillade and drummer Frédéric Vaudaux, are ZED, a free-music unit that delivers a mix of wild free-form improvisation and punk energy for an hour of high density sound surge. Fasten your seat belts.